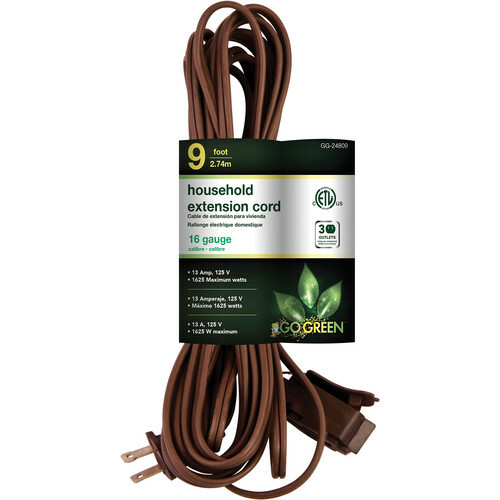 The 9', brown Household Extension Cord from Go Green is a 3-outlet, extension cord that is rated at a maximum 1625W at and 125V. This 16-gauge cord is cETLus certified. Box Dimensions (LxWxH) 8.6 x 1.3 x 1.3"
Household Extension Cord (9', Brown) is rated 5.0 out of 5 by 1. Is this an angled/low profile plug? I ordered these and it turns out they have a regular straight plug. Thanks for the prompt &amp; free returns!